This page is dedictaed to community News, Events and Information. Dr. Arnab Mukherjea, Professor of Health Sciences at California State University, East Bay, is leading a study to understand the reasons why Pakistanis decide (or not) to get screening for colorectal cancer. 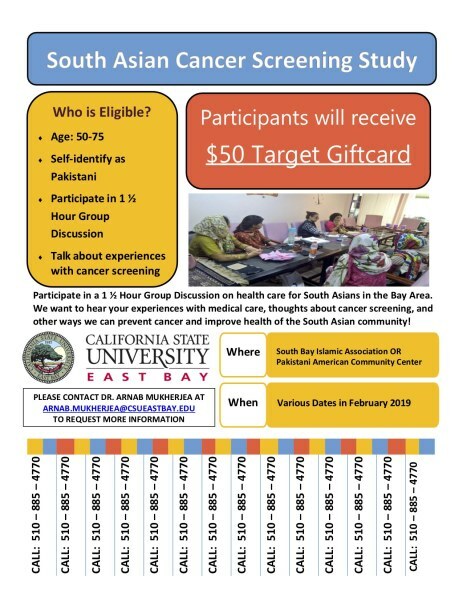 Rates are low among South Asians in California, but the specific experiences and perspectives of Pakistanis about screening are unknown. Dr. Mukherjea is joined by Pakistani student researchers from his university, as well as UC Berkeley, who are committed to improving the health of the community to which they belong. It is important that health research of South Asians include Pakistanis so that their needs and preferences are included in recommendations for improved policies and programs serving this community. Accordingly, Dr. Mukherjea is requesting that you consider participating in a group discussion to provide information about decisions related to getting screened for colorectal cancer. The groups will be held at a time and place convenient for participants. Refreshments will be provided and community members will receive a $50 gift card in appreciation for their time and effort. All information provided will be held in strict confidence and no identifying information will be shared with anyone outside the research team. 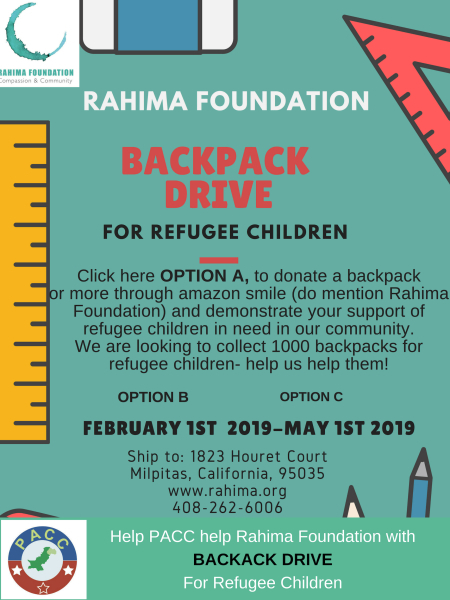 If you meet the following criteria and are willing to participate, please contact Dr. Mukherjea via email at Arnab.Mukherjea@CSUEastBay.edu or by phone at 510-885-4770. Contact Dr. Mukherjea via email at Arnab.Mukherjea@CSUEastBay.edu or by phone at 510-885-4770. 1. The advertiser to provide graphics in jpg format. It needs to be in 72 pixels/inch. The size to be no larger than 3" wide and 2" high. We recommend that you provide a link to your website to get more information. 2. PACC will place the graphics on our website in the middle section at the bottom of the first photo gallery, above or below upcoming events. See www.pacc-ca.org for example. PACC may adjust the size of the advertiser graphics to fit the space in an aesthetically pleasing manner. 3. PACC will place the advertisement at least once a month in its newsletter. 4. Our event sponsors have the priority. After that, the placement will be first for the advertisers who are on annual basis and second for the ones on a quarterly basis. The placement will be on a first come first serve basis. PACC may rotate the placement at its sole discretion within the two categories. 1. $200 for a quarterly subscription, $600 for an annual subscription. No Refunds will be given for any reason.